This matter comes before the Court on plaintiff's action for rescission of a deed. The plaintiff is the grantee under a quit claim deed from the defendants to lots 1, 2, 3, 4, Section 28, Division 2 of Standish Gardens in Plymouth, Massachusetts, hereinafter referred to as locus. The defendants have brought a third party complaint against Marguerite M. Hooley, the defendants' predecessor in title; James M. Oates, Jr., the lawyer who drafted the deed in the Hooley-Zegarelli transaction; and Lawrence DiLorenzo, the real estate broker in the Hooley-Zegarelli transaction. There appears to be two independent chains of title, both going back over 50 years to a warranty deed before converging. For convenience the two chains will be referred to as the Zegarelli and the Hammond chain. The Zegarelli chain of title traces back without difficulty to a warranty deed from Corinda N. Sanford to Frank W. Chipman dated January 13, 1916 and recorded in Book 1240, page 68. (Exhibit No. 11), The Hammond chain of title traces back without difficulty to a warranty deed from Rhodey F. Sturges to William H. Fessenden; Fred A. Raymond, Fred Hatch and William B. Eaton dated December 28, 1883 and recorded in Book 501, page 543. (Exhibit No. 12, p. 12). We know that the locus was a part of the land owned by the Herring Pond Indians in 1870. Upon the petition of these Indians the General Court appointed two commissioners who made partition of the Indian lands. Pursuant to the deed of the commissioners in the division of 1870, lot 49 of the Great Lot (which encompasses locus) was set off to one Mariall Conant (Exhibit No. 12, p. 5). "Ezra R. Conant, Rhoda F. Sturgis (formerly Rhoda F. Conant), Carinda Sanford (formerly Carindia Hicks) all of Marshpee .... and Alonzo Augustus Brown of Harrisburg in the County of Dauphim and state of Pennsylvania"
"Our title is derived from said William R. Conant sometimes called William Conet and William R. Conet) who died about 1861 intestate, leaving a widow who is now Rhoda A. Sturgis, one of the grantors, and two children, the older being Ezra R. Conant, another of the grantors, and the younger being Merrial H. Brown, formerly Merrial H. Hicks (also written Mellie H. Hicks) who died intestate about 1896, leaving no husband and two children, one of whom is Carindia Sanford, another of the grantors, and the other of whom is Alonzo A. Brown, the last of the grantors." Merriall Conant is described in the Commissioners' deed (Exhibit No. 12, pp. 1-5) as the minor daughter of William R. Conant of Mashpee. 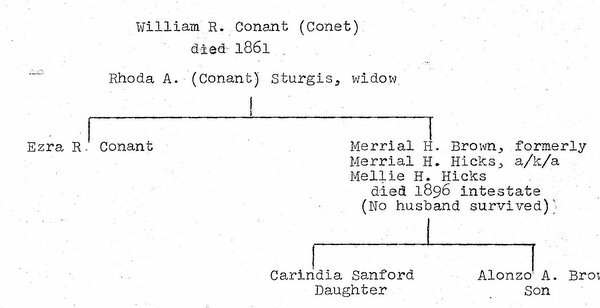 Ezra Conant was listed therein as the minor son of William R. Conant. Considering exhibits 12 and 17 together, it could be concluded that the Mariall Conant described in the Commissioners' Deed is the Merrial H. Brown, Merrial H. Hicks and Mellie H. Hicks described in Exhibit No. 17 and that Corinda N. Sanford is Carindia Sanford, the daughter of Mariall. If Mariall Conant Hicks Brown did not convey lot 49 of the Great Lot (locus) during her life, then her two heirs, Corinda Sanford and Alonzo A. Brown, would have inherited it. The defendants' title examiner found no probate or death records for this Mariall Conant Hicks Brown under a number of variations of spelling or for Alonzo Brown. Corinda N. Sanford, as we have seen, conveyed this lot to Frank W. Chipman (Exhibit No. 11) and thus by mesne conveyances it came to the defendants Zegarelli. Thus, the Zegarelli chain depends upon intestacy and noconveyanees out from Mariall Conant Hicks Brown. Solomon Attaquin, Justice of the Peace"
"I Melley H. Hicks ... put Rhodey F. Sturgis, to be my true and sufficient attorney for me and in my name and stead, to enter in and settle the estate of my Deceased Father and grandmother of whom I am an heir." However, since Mariall Conant Hicks Brown owned lot 49 of the Great Lot (locus) through the Commissioners' Deed and not through the estate of her father or grandmother this power of attorney is not applicable. Thus, there are potential problems with both chains of title. Were this an action to quiet title, the Court would have to consider the effect of the absence of a recorded power of attorney, an improper indexing of deeds, and the effect of other possible defects in the chains of title. But on the view the Court takes of this case the title questions are not material as the issue is a much narrower one. Testimony and evidence at trial centered on whether the Zegarelli chain constitutes a good record or marketable title and all parties have argued this point. However, plaintiff has merely assumed a duty on the part of the defendants to deliver a good record and marketable title and has never articulated any theory under which the plaintiff would be entitled to recission at this point in time for the defendants' failure to so do. The plaintiff cites two cases in his brief: Jeffries v. Jeffries, 117 Mass. 184 (1875) and Mahoney v Nollman, 309 Mass. 522 (1941). Both of these were actions for specific performance of a purchase and sale agreement and state the principle that in a proceeding for specific performance the potential purchaser will not be compelled to accept a doubtful title, that is, one which may reasonably be expected to expose the purchaser to litigation. While a seller, by reason of the terms of a purchase and sale agreement, may have a duty to deliver a good record or marketable title, acceptance of a deed discharges the duties of the seller except for those that are embodied in the deed. Pybus v. Grasso 317 Mass. 716 (1945). Since acceptance of the deed has occurred here, it is necessary to consult the deed itself to determine the duties of the defendants. The plaintiff's deed (Exhibit No.1) contains quitclaim covenants, i.e., the defendants have covenanted that the granted premises are free from all encumbrances made by him and that he will defend against all persons claiming by, through or under him. G. L. c 183, §17. Whatever defects may exist in the Zegarelli chain of title, it has no where been claimed that these defects were created by the defendants. It is clear that there can be no recovery on the covenants contained in the deed. By deed dated December 4, 1972 and recorded in Book 3843, page 476 third party defendant Marguerite M. Hooley conveyed a number of lots in Standish Gardens, including locus, to the defendants. (Exhibit No. 7) Third party defendant Attorney Oates represented both parties in this transaction. (Tr. 166) Attorney Oates knew that no taxes had been paid on the land conveyed. (Tr. 96). Attorney Oates did not request from the town of Plymouth a certificate of municipal liens previous to the sale although it is a usual practice to so do (Tr. 100) because he understood he would have had to obtain one for each of the 200 odd parcels sold. (Tr. 101). Attorney Oates, who is a Land Court examiner, was familiar with the title and informed the defendant he had checked it and that is was a good record and marketable title. (Tr. 165). In October 1973, the defendants asked Attorney Goldberg to check their title. (Tr. 103-104). Attorney Goldberg hired a title examiner and received a report from him. Thereafter Attorney Goldberg went to the Plymouth Assessors' Office and was informed taxes were not assessed on Standish Gardens because it was considered low value land. He was not informed who the assessed owner was. (Tr. 106) He rechecked the title back to 1916 and informed the defendant his title was good. Thereafter, in 1975 the defendants sold locus, a portion of the land conveyed to them by Miss Hooley, to the plaintiff. Attorney Goldberg represented the defendants in this transaction, drafted the deed, and sent a bill for drafting to the plaintiff. (Tr. 107). The plaintiff was not represented by an attorney in this transaction. Attorney Goldberg became aware that locus was assessed to Hammond as a result of a subsequent title examination by Ms. Prue. (Tr. 107). This examination occurred after the defendants sold locus to plaintiff. The above facts do not support a finding of fraud, misrepresentation or mutual mistake. Whatever statements the defendants made to the plaintiff concerning the defendants' ownership of the land, there is no evidence these statements were made in bad faith. The defendants had been informed that according to the Plymouth assessor's records they did not have title. They immediately went to their attorney, who, after searching the records, assured them that they in fact did have good title. They did not disclose the assessor's report to the plaintiff, nor were they under any duty so to do. By the same token they in no way deceived the plaintiff as there was no evidence of any inquiry being made or conversation being held with the plaintiff as to this. At most there was non-disclosure, certainly no misrepresentation. As a result, there can be no recovery on the basis of fraud, misrepresentation or mutual mistake. Yaghsizian v. Saliba, 338 Mass. 794 (1959); Swinton v. Whitinsvi1le Savings Bank, 311 Mass. 677 (1942). See also Pybus v. Grasso, 317 Mass. 716 , 720-21 (1945). Thus, the Court concludes the plaintiff is not entitled to relief and orders the plaintiff's complaint dismissed. As the defendants seek judgment against the third party defendants for all sums that may be adjudged against the defendants in favor of the plaintiff and as the Court has concluded the plaintiff is not entitled to recovery from the defendants, it is unnecessary to consider the allegations of the third party complaint. The plaintiff has submitted three requests for rulings. All of these concern the status of the Zegarelli chain of title, that is, whether the title was good, clear and marketable. As this determination is irrelevant to the present action, the plaintiff's request for rulings are not granted.